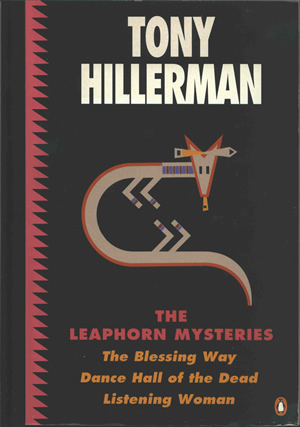 This is the UK paperback edition of The Leaphorn Mysteries published in London by Penguin in 1994. The cover design is unattributed. The background is black, with a jagged hot pink border along the spine. The author's name is printed in white in large type at the top of the front cover. Below is a simple petroglyph-style drawing. Below the drawing, the title of the book is printed in hot pink, and beneath that, the titles of the three incorporated novels in pale orange. The penguin logo is at the bottom right corner of the front cover. On the back cover, the jagged hot pink border continues along the spine for the top 75% of the cover. The top section has, printed in white on a black background, synopses of the three included novels. The bottom quarter of the cover is white and contains the publisher's imprint, bar code, and book price. Binding: Color paper covers. On the spine, the author's name and book title are printed above a small version of the cover figure, the book ISBN, and the penguin logo.